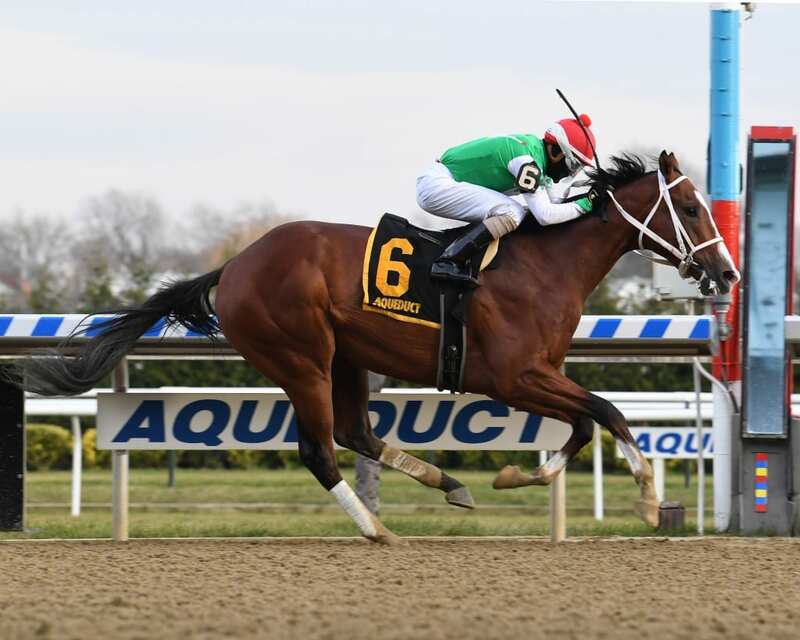 Maximus Mischief won the Remsen Stakes at Aqueduct. Photo by Viola Jasko/NYRA. Alex Zacney wasn’t yet in kindergarten when his father Chuck purchased Afleet Alex back in 2004, Zacney père and his partners paying $75,000 for the Northern Afleet colt at the Fasig-Tipton May Midlantic sale of two-year-olds in training. Aged five when his father’s first horse won two legs of the Triple Crown, Alex doesn’t remember much from that thrilling spring. Fourteen years later, it was Alex who called his father’s attention to another horse at that same sale. Where they were was the winner’s circle for the Remsen Stakes (G2) after that Into Mischief colt, now named Maximus Mischief, got his third win in as many starts, earning 10 Kentucky Derby points, good in these early stages for sixth on the leaderboard. Zacney and his partners in Cash is King LLC and LC Racing had to dig considerably deeper than they did back in 2004, going to $340,000 for the bay colt bred in Kentucky by Martha Jane Mulholland. “I loved his work [at the sale, where he breezed an eighth in 10 1/5 seconds],” said Zacney. “His sire is Into Mischief. I knew he was big but I thought he was athletic. Alex Zacney offered a different perspective. 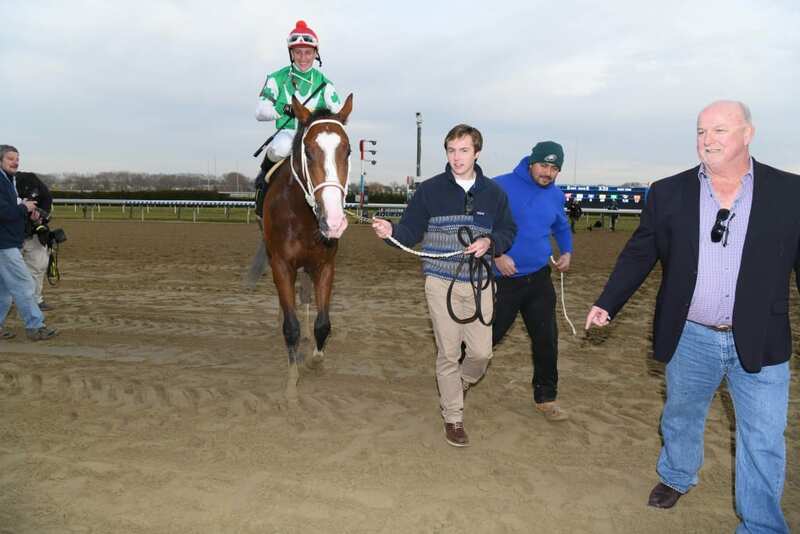 Butch Reid (right) and Alex Zacney (with lead) guide Maximus Mischief into the winner’s circle after the Remsen. Photo by NYRA. The colt’s sales history didn’t exactly inspire confidence; sold as a weanling to Machmer Mall for $165,000 at the 2016 Keeneland November sale of breeding stock, he was an RNA as a yearling at Fasig-Tipton Saratoga ($170,000) and the Fasig-Tipton Florida sale in March of this year ($245,000). Trained by Robert “Butch” Reid, Maximus Mischief made his first start at the end of September at Parx, winning by 8 3/4 lengths as the odds-on favorite. Three weeks later at Parx, he won by six lengths at five cents to the dollar, handily beating the two other horses entered. He was a narrow second choice in the Remsen, going to the post at 1.40-1. Breaking from post 6, Frankie Pennington sent Maximus Mischief to the lead and they never looked back, winning by 2 1/4. He was briefly challenged at the top of the stretch but was never seriously threatened. He introduced his son as his bloodstock agent, a title Alex admitted was a bit of an exaggeration. Now 19, he attends Gettysburg College, keeping an eye on his father’s horses as much as he can. His memories of that 2005 Triple Crown season might be dim, but if these last three races are an indication of the horse’s talent, Maximus Mischief might take the Zacney family on another ride to the classics. NextWhich races are in Friday’s Stronach 5?